CooksRecipes has quality, kitchen-tested recipes for a variety of ham steaks and kabobs that you can count on for successful deliciousness. 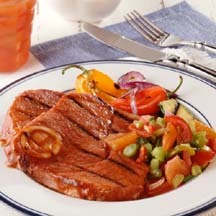 Grilled ham steaks are given the works with this spicy marinade and served with Spicy Bloody Mary Salsa. 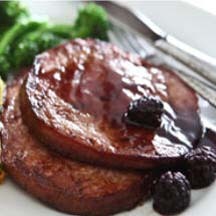 Elegant dining doesn't get much easier than this pan-grilled ham steak served with a rum-kissed blackberry sauce. 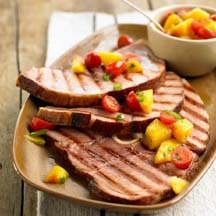 Ham steaks are quick on the grill. Serve with grilled vegetable kabobs.